You might remember how, for a few months, I was a staff writer for a Nintendo fan site. The site is gone now and the admin vanished, but my love for writing, video games, and writing about video games is stronger than ever, so I’m happy to continue doing it on my blog. I’ve also decided to extend my reviews/analyses outside of the gaming world (with music and films in mind), but for now, here’s the first in my nowPlaying series: Xenoblade Chronicles, developed by Monolith Soft, for the Nintendo Wii. All images taken from the official site, not owned by me. When you ask people about the greatest video games ever made, there are a few titles that’ll come up on almost every list: The Legend of Zelda: Ocarina of Time. Half-Life 2. Resident Evil 4. In a perfect world, Xenoblade Chronicles would be one of them. It’s near the top of mine. Released for the Wii in 2010, this one took a while to leave Japan. It didn’t reach America for nearly two years, coming out shortly before the Wii’s successor, the Wii U. The game received a limited printing, so a copy is going to cost you anywhere between $60 and $80, but it’s worth it. The word “epic” is overused these days, but it fits this game perfectly. The story opens with two titans fighting each other in an otherwise empty ocean. They strike fatal blows at the same time, but their lifeless bodies remain standing, and from these spring forth all living things. You play as Shulk, a young boy who grew up on one of the titan’s knees. Did I mention the game is epic? The whole world consists of the bodies of the titans. At any point you can look into the sky and see their arms, their heads, you can look across the ocean and see most of the other titan—all but the part that extends beyond the clouds. An example of the view from one of the legs, complete with the torso of the titan in the distance, and its extended sword hovering above. This game is huge. Everything about it is massive: Open-world areas in the same vein as Bethesda’s latest games, seamless combat (nearly all of the game’s loading screens are just there to load cinemas, only a few places require a loading screen transition), character customization; everything you’d expect from an action RPG, but bigger. My final play time, for example, was 75 hours. There were still dozens of side quests I hadn’t done, and I could have sunk another few hours in to level up and have an easier time with the final bosses (because a game this big can’t have just one). The graphics are good, for the Wii. You can find screenshots, but they don’t do it much justice. The wind blowing through the grass, the people and creatures going about their lives, the ever-looming titans, you have to see it for yourself. It’s a Wii game, so by today’s standards it’s dated, but even as such it looks good. Colony 6, where the main characters grew up. From this viewpoint, you can travel all the way into the town and along its streets without loading screens. The characters you face are, for the most part, lovable. Off the top of my head, only one enemy character comes to mind who I could describe as one-dimensional, and she’s not a major character. Everyone else is a well-acted, well-designed being, complete with their own motives and reasons, and this adds to one of the game’s running themes: Existentialism. Your run-of-the-mill game can be pared down to “Find the bad guy and kill him”. You’ll be doing a lot of finding in this game, and you’ll be doing your fair share of killing, but you won’t want to. Instead of faceless “baddies” that only stand in your path, the game presents your adversaries as people who happen to be on the other side of the coin. Shulk, the main character, begins as a naive kid with a desire for vengeance, but transforms into a strong, noble man, one who tries to reason before ever lifting his sword, and who understands his enemies. I have a feeling the game’s director, Tetsuya Takahashi, might have been influenced by the works of Orson Scott Card and Ursula K. Le Guin: Before Shulk defeats his enemies, he has to know and love them, and he feels every loss along his path. The game’s story goes on to tackle the idea of what it means to be part of a Universe in which you aren’t the only inhabitant. I don’t think I’ve ever seen a game do this before. There are often moments of depth, often strong characters that you feel for, but Xenoblade takes it to a new level. As big as the game is, it must also be described as “deep”. 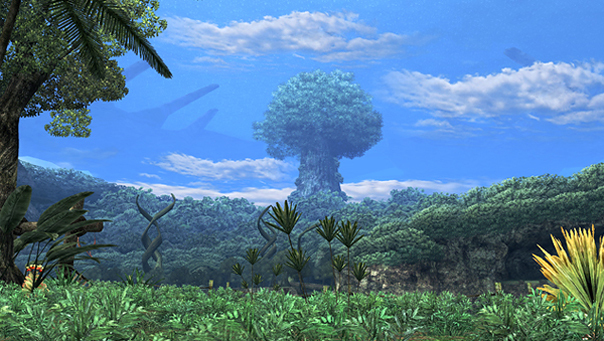 The tree in the background is just a texture from this distance, but you will eventually reach the top of it in-game. Some of the plot points are trite, but most are unpredictable. The game threw a lot of curveballs. In most cases I had no idea what was coming until the second it happened. It does suffer from some overly-descriptive and repetitive dialogue (sometimes the characters just plain talk too much), but it’s nothing you won’t find in the average video game. The gameplay itself is fun, but a lot of people seem to have trouble with the battle system. Unlike most games, you won’t be mashing the A button to obliterate everything in your path. Characters (there are several in your party, and you get 3 on-screen at a time and may play as any of them) auto-attack. Your job as the player is to choose where they go. Some attacks are more powerful from behind, some from the side, etc. You also have special attacks called “Arts” that you choose from, giving combat a layer of strategy comparable to that of a turn-based RPG, but the battles won’t wait for you, and timing is everything. Another word I might use to describe the game is “exhausting”. The last ten hours or so started to wear me down. I did get a little tired of running around fighting random creatures and fetching items for NPCs. The game’s design is relentless, every new place you find is as large and as full of things to explore and do as the last, but by the time I reached the last handful of areas, I just wanted to skip them and go straight into the main quests. I never really wanted to stop playing, but if there had been another ten hours of main story, I might have. The upsides far outweigh the downsides, and in the end I’m so glad to have played through this game. It’s one of the most original and unique stories I’ve ever encountered, especially in the world of video games. In January 2013, Nintendo revealed a trailer for a game by the same company, Monolith Soft, that is very heavily implied to be a sequel to Xenoblade Chronicles. I can’t wait to see what’s in store this time around. The possibilities are limitless, and I’m looking forward to what will surely be one of the richest gaming experiences offered this generation.